Even though holidays like Easter tend to always be about eating a specific animal-based food (like eggs or lamb), we know that it's definitely possible to create delicious and nutritious meals everyone in the family will enjoy! Don't believe us? Then check out the vegan easter recipes we collected for you below. Holidays are the time of the year during which it's fine to eat a little richer food (depending on your health situation, of course). This is why almost every single recipe will contain at least some amount of vegetable oil or refined sugar. As for the oil, you can just omit it in most cases, which is what we would do. It won't hurt your arteries very much to eat it a couple of times a year, though. 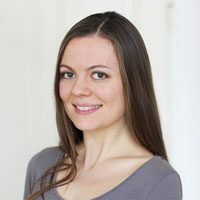 If you'd like to know more about why we don't think it's a great idea to consume oils on a regular basis, see our extensive article here. You get to decide! Now, let's dive into the egg-less goodness. 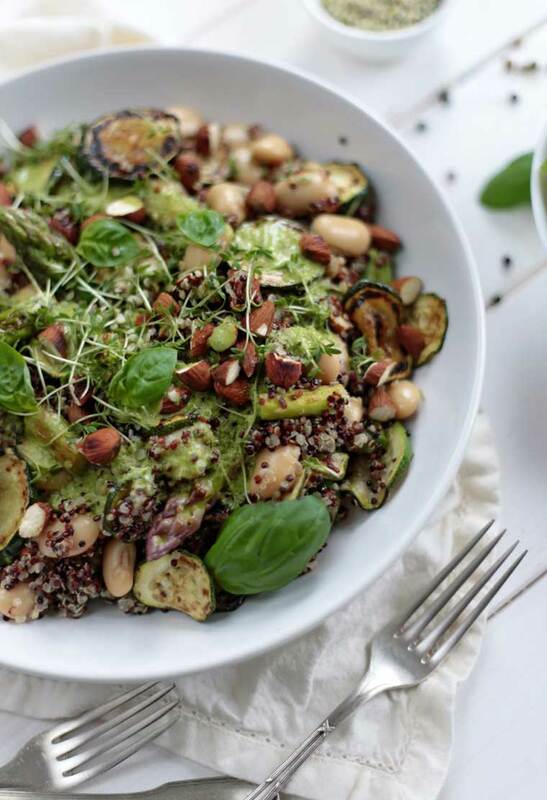 This quinoa salad is a new spring edition with beautiful, crunchy greens and a satisfying fresh basil dressing. Simple to make, highly shareable and absolutely addictive! Green Evi packs a lot of veggies and delicious nutrients into one flavorful bowl for you. How about a thick, creamy, and soul-warming vegetable pot pie? These are done in under one hour - including clean up time. It's up to you to either pick up some pie crust/biscuits from the store or make them from scratch. These gluten-free and naturally sweetened lemon bars will be a huge hit! Nothing could be more refreshing and satisfying during springtime. With an oat crust and cashew/coconut filling, nobody will be able to resist this cheesecake-like goodness. Quick, hop on over to the Minimalist Baker for the recipe! Can you believe that this recipe is completely eggless? Yes, t﻿﻿﻿his veg﻿﻿an masterpiec﻿﻿e is a frittata (or quiche) made thick and creamy by using tofu, arrowroot, and a few more magic ingredients. And the crust is mainly just rice. Sounds awesome? Check it out! Looking for something more quick and simple? 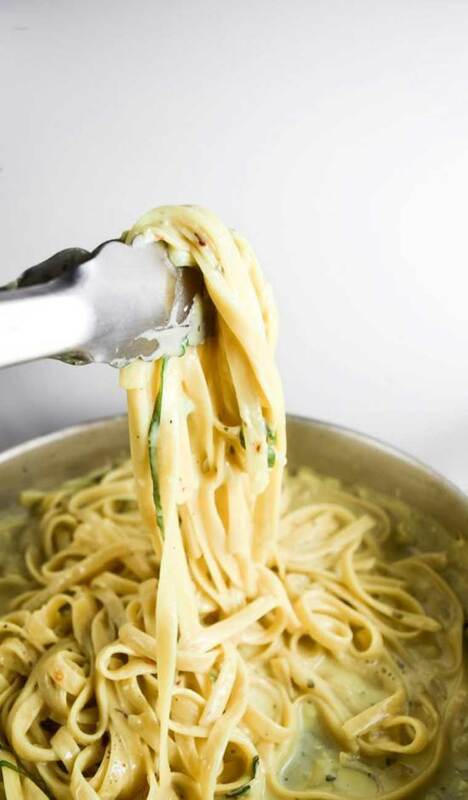 This one pot fettuccine is deliciously creamy and only requires 5 minutes of prep time. We love that it's even low in fat and doesn't require any fancy ingredients. It's a must this spring! The kids will love these eggless fruit baskets! Using only 3 ingredients (if you buy the puff pastry and soy yogurt at the store) and taking around 5 minutes to prep, you can definitely put this on the list for a quick last-minute Easter idea. With all this green goodness, dishing up a spring soup like that will give you a huge boost of nutrients and deliciousness. The added cashew cream is definitely a bonus to this simple yet fantastic Easter recipe! 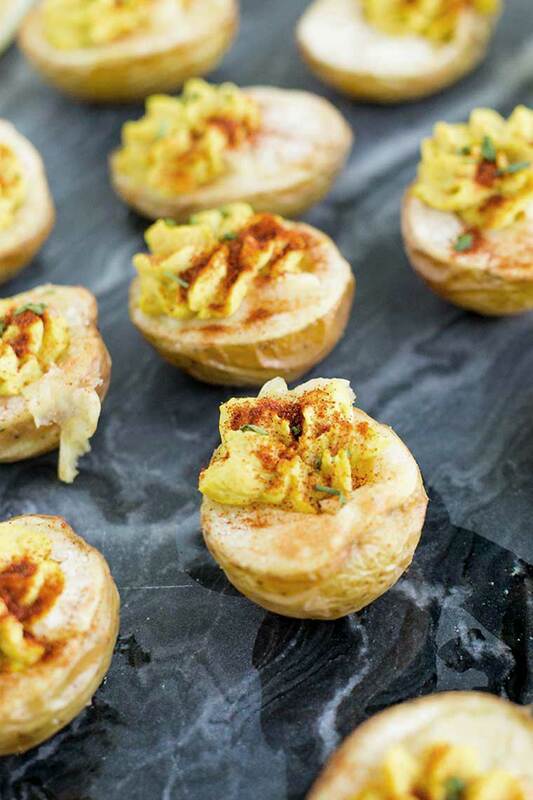 Should you be on a budget this time around, go for these cheap deviled potato "egg" bites. Using chickpeas, tahini, and turmeric as a filling, it's not only creamy and delicious but offers a lot of protein and some healthy fats. Awesome side dish or snack! This one pot meal is our favorite choice this Easter! Comforting, chewy gnocchi with seasonal, fresh veggies work together in perfect harmony when it comes to taste and deliciousness. This dish also offers a light citrus note and is just overall one of a kind. This curd is the real deal. It is slightly more white in color because there are no eggs, but the lemon flavor is 100% there. This dessert comes with a slight coconut flavor, isn't too sweet and can be eaten straight away or as a topping for your waffles or pancakes! 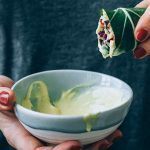 This delicious and super healthy recipe can be admired on one of our favorite blogs around the web! Ana's spring greens soup offers lots of powerful nutrients and antioxidants as well as a creamy texture from the coconut milk. We totally love the baked parsnip fries as a side, too! Usually, potatoes are drenched in oil to make them crispy and chewy. But lo and behold, here's a healthy yet very delicious version of a no-oil hash brown patties recipe! If you want to make it super convenient, just use frozen hash browns, mix them with the other ingredients for around 5 minutes and off into the oven they go! Would you believe that this creamy deliciousness is based on chickpeas? The water from this legume can be used to create a very similar texture compared to egg whites but without the nasties. 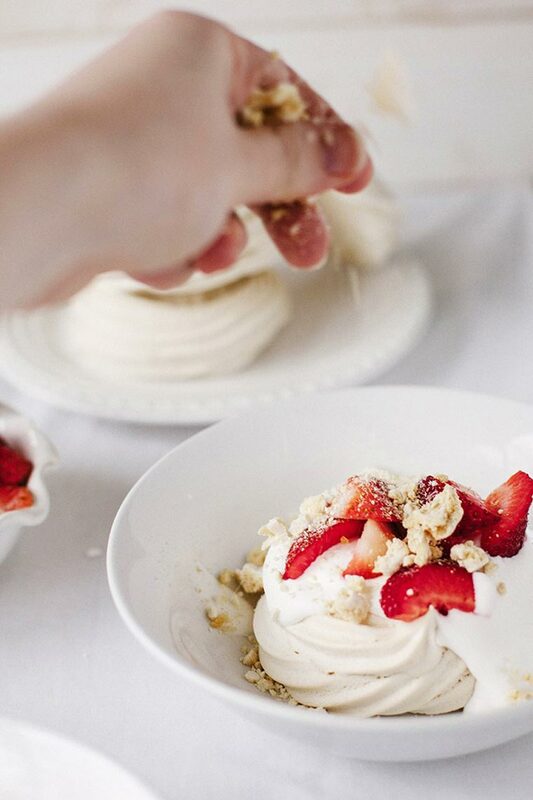 This sweet treat is super crunchy and chewy, and we love the fresh strawberries on top. Who doesn't love Italian food? This light and veggie-rich lasagna recipe could really hit the spot this year for your family gathering. Easier than it looks and using just 10 ingredients, this soul food cannot really go wrong. 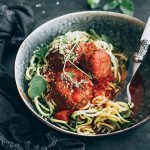 So if you have an hour to spare and want to make both your vegan and gluten-free guests happy, check out the recipe now. 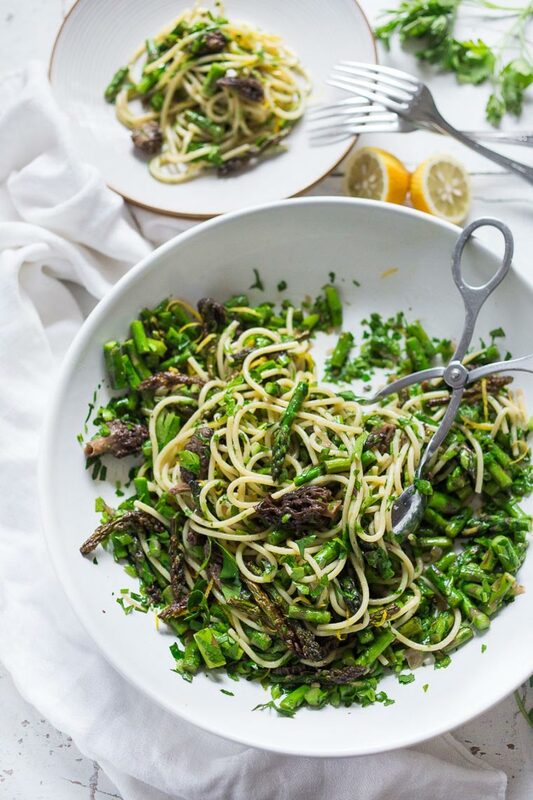 This tasty dish is a lemony asparagus and mushroom pasta salad with lots of fresh parsley and green onion. Doesn't that sound really heavenly? It offers everything you're looking for in a spring or summer dish and perfectly combines filling starches with fresh seasonal veg and lemony deliciousness. Go get the recipe today and try it! These vegan Superfood Berry Cashew Cream No-Bake Bars are naturally colored with fruit and vegetables! And they’re so creamy nobody will ever know they’re healthy and plant-based. Give this spring a nice colorful touch with this treat and watch your kids fall in love with nutritious food. Who doesn't love fresh, colorful finger food? 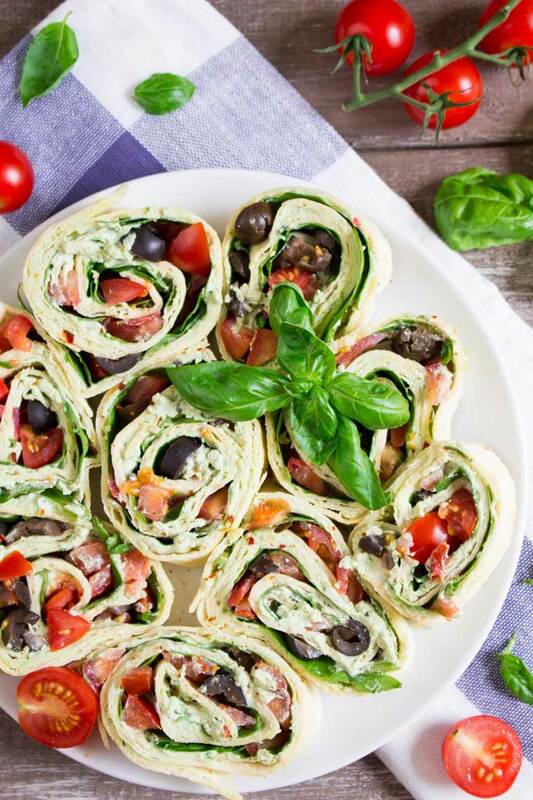 This easy and tasty crowd pleaser can be prepared within 15 minutes in advance so you'll have less stress right before your family gathering. They are perfect for get-togethers and will taste awesome to kids, vegans and meat-lovers alike! Only 5 ingredients are required for this colorful and healthy snack. And you probably have most of them at home right now! Taking only 10 minutes to prepare, you can store them in the fridge for days and just have them on hand when needed. Try this sugar-free and oil-free goodness! Last but definitely not least, we have this tasty low-fat pasta salad. Yes, pesto doesn't have to mean tons of oil or nuts! This recipe uses peas as a base, making it protein-rich and satisfying. You can enjoy it either warm or cold and prepare it withing 10-15 minutes. What will you be making this Easter? 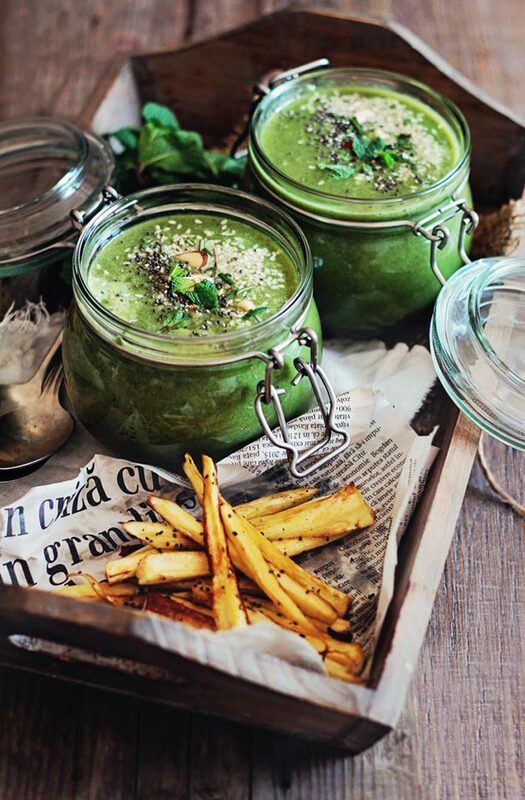 Will you be trying any of these recipes or do you have your own plant-based go-tos? Let us know in the comments below. It all looks so good, I am going to try several of these yummy recipes. Thank you so much. I will let you know how it goes. Let us know which ones and if you liked them!